Hurrah! Bridget Jones is alive and well in London!! 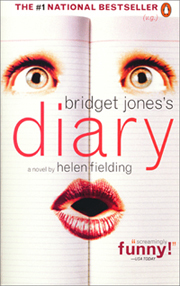 Helen Fielding the UK author who brought to life the story of the neurotic clumsy singleton in Bridget Jones's Diary and Bridget Jones: The Edge of Reason is publishing all new and hilarious WEEKLY Bridget Jones Diary entries as a newspaper column in the UK's "The Independent". You can catch up to Bridget in 2005 as she laments on her post Mark Darcy break up and is feeling the baby itch. Its all about metallics in fashion this season and here are some quick ways you can freshen up your wardrobe with some new shiny things. 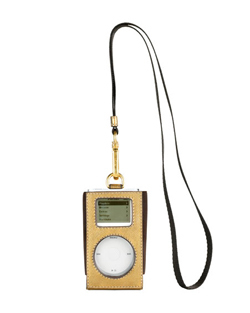 Luxe up your ipod with a Prada Metallilc Gold or Silver Case. I want one in gold and may head down to Neiman Marcus or the Prada store to take a look at it in person. Ok I know this is a picture is of a red case, but if you have a kate spade store near you, you can get one in metallic gold. Its really cute and you can hang it from your workout bag, purse, or off your belt loops on your jeans. Nothing more classic and comfortable than ballet flats and these Metallic Ballet Flats from Urban Outfitters are a steal for just $25. I snatched up a pair in bronze. Of course no one does it better than Marc Jacobs for that retro modern style that I love so much. 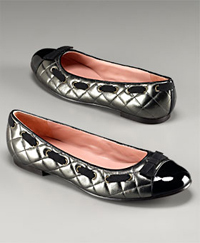 These vintage style metallic ballet flats are the ultimate in coquette.